Readers of this blog have seen these basic process described several times: (1) rain transforms into runoff when it hits the ground, (2) runoff accumulates and flows in rivers or municipal drainage infrastructure, (3) the capacity of the flow systems determines whether flow "backs up", "surcharges", "spills", or generally flows uncontrollably to where we don't want it to go, causing flooding. Using Environment Canada's data and research, we have shown that rainfall intensities have not increased in southern Ontario here. In fact there are more statistically significant rain intensity decreases than increased south of 44 degrees. So the rainfall influence on runoff is not increasing. 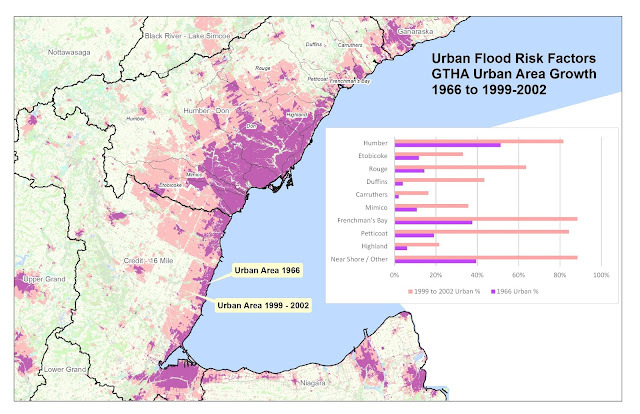 But runoff has been increasing after decades of urbanization under the today's stable or decreasing rainfall intensities. The following maps show urban expansion in Mississauga, Oakville and Burlington Ontario from 1966 to about 2000 (data varies from 1999 to 2002). 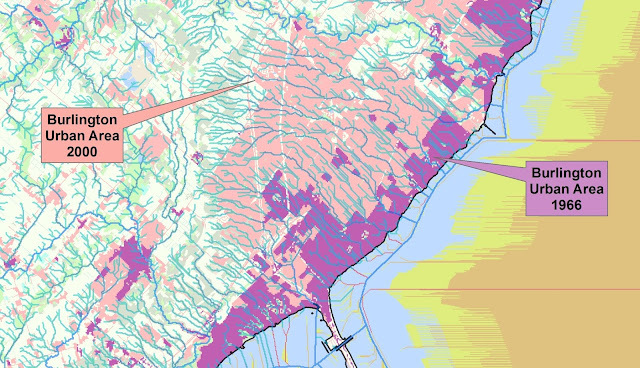 The overland flow system path based on Ontario conditioned digital elevation model is superimposed on the land use map so that the impact of urbanization and runoff into the drainage system can be considered. 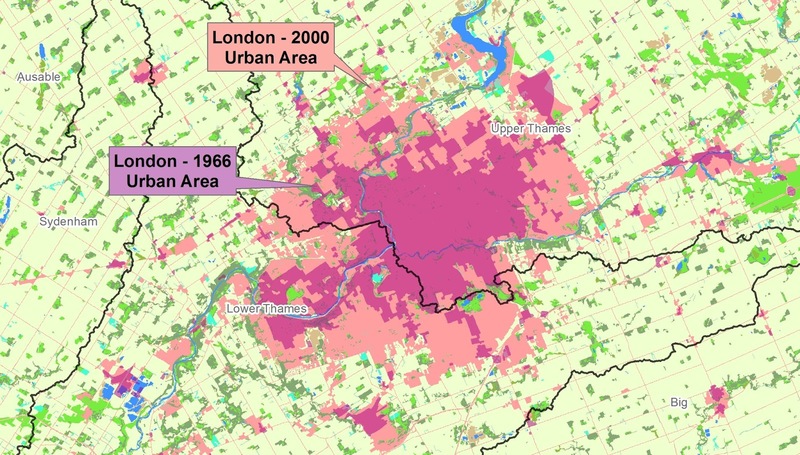 The effect of urbanization in Mississauga on runoff would be most acute in the smaller watersheds (e.g., not the Credit), where the upstream urban area has increased significantly since 1966. Likewise in Oakville - Bronte Creek, a large watershed more slightly influenced by the city's sprawl, has not been affected to the same degree as the smaller Fourteen Mile Creek to the west, where a high relative change in land use over that smaller watershed has occurred throughout the city. 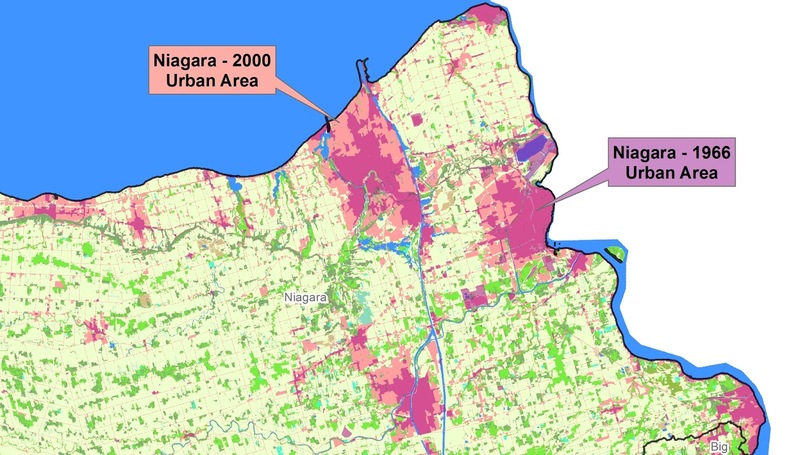 Same in Burlington - many small creek watersheds originating off the escarpment have dramatically increased urbanization over three decades. Burlington is characterized by creeks that have been realigned, straightened and encroached upon. These can be expected to be more sensitive to increased runoff rates due to expanded urbanization. 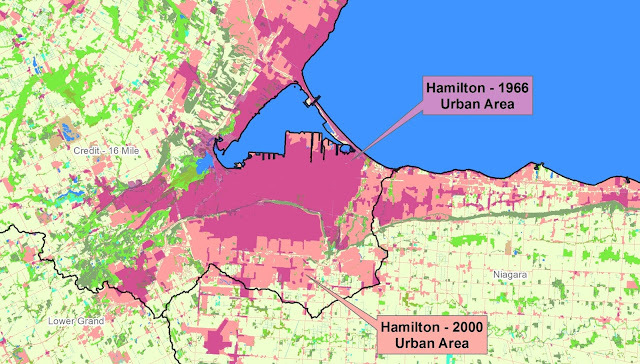 Parts of Hamilton have been urbanized up to the watershed divide (black line) by the late 1990's / early 2000's. How does this affect runoff into the old 'core' built to pre-1960's standards? 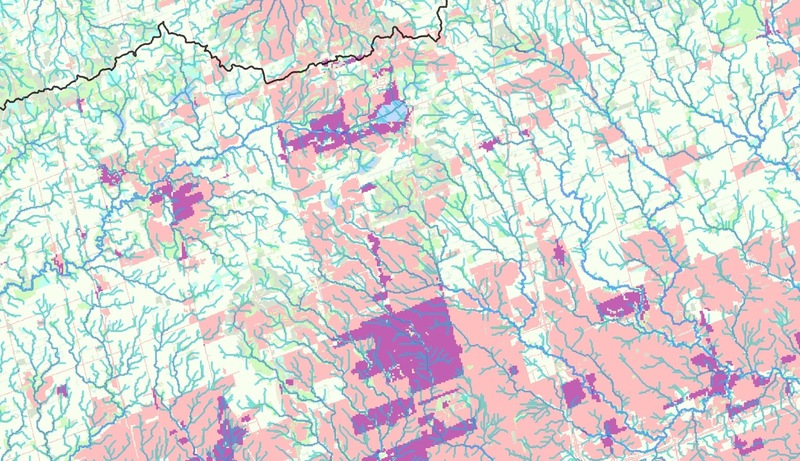 "The unsatisfactory state of hydrology is, in the final analysis, the result of the dichotomy between the theoretical recognition of hydrology as a science in its own right and the practical impossibility of studying it as a primary discipline but only as an appendage of hydraulic engineering, geography, geology, etc." Vit Klemeš in Dilettantism in hydrology: Transition or destiny?, Water Resources Research, Vol. 22, 1986. That explains it! Nobody studies hydrology in its own right, and so this limp appendage of other scientific pursuits has been ignored. 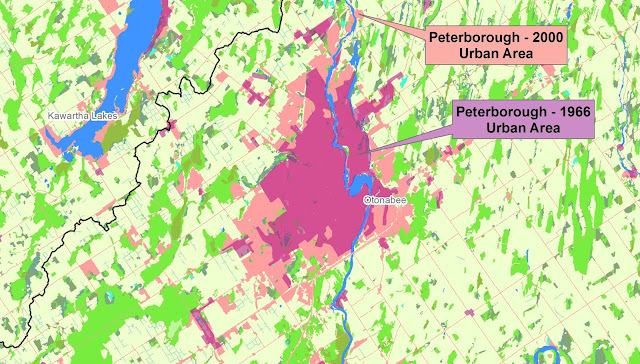 Pity - because hydrologic science and simple quantifiable land use changes can explain increased runoff and increased urban flood damages in Ontario municipalities. Why is it ignored? Because hydrology is just the run up to other things like dynamic hydraulic simulations and then infrastructure construction. 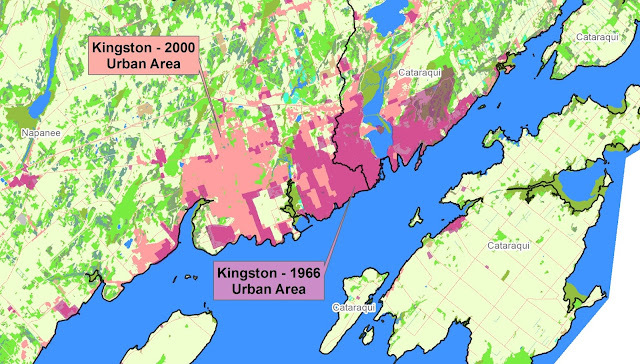 Take a look at these Ontario urban area land use maps, and see how the limits of urban areas have increased over thirty years or so from 1966 to the late 1990's. It can be dramatic. 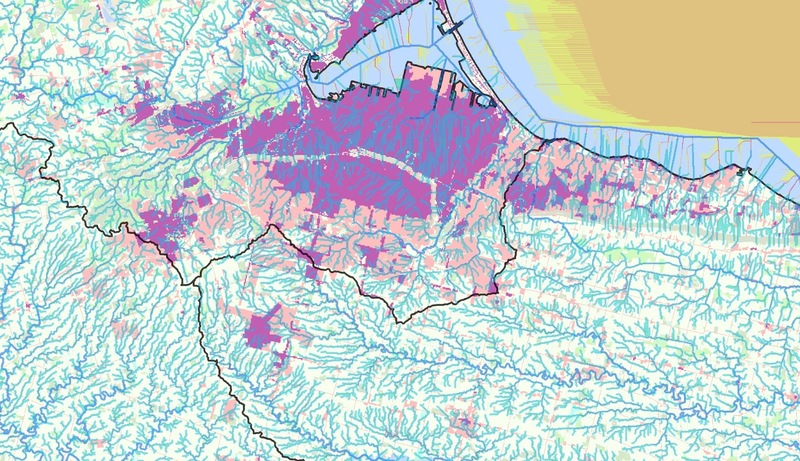 For some catchments, the increase in urban land coverage can be an order of magnitude. Sure, some of these areas developed between 1966 and 2000 have stormwater management controls up to a point. But it is commonly accepted that the on-site local stormwater controls do not completely address cumulative volumetric runoff impacts at larger scales. And the controls are finite - not controlling the rarest storms that drainage infrastructure could see in its design life. So expanded urban areas can drive downstream flood risk. Yes, every catchment is different and maybe no property is at risk downstream of some urbanized area (i.e., dedicated drainage easements and wide regulated flood plains have maintained a wide major flow path) - but in may cities the overland flow path has not been mapped managed or preserved, so increased runoff and flood risk can result. 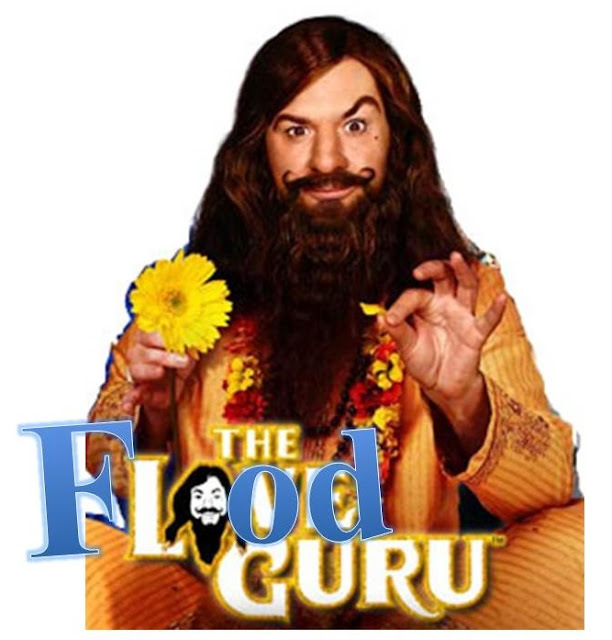 Brought to you by the Flood Guru. management needs for flood mitigation. 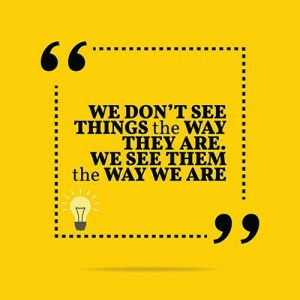 Could it be that we have ignored the obvious "secret"? That is, the effect of increased urbanization on urban flood risk in Ontario. 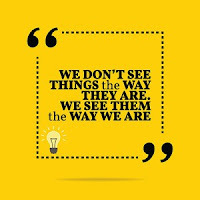 It seems so. Mapping of urbanization patterns in that Greater Toronto, Golden Horseshoe, and the Big K-W areas shows obvious, dramatic increases in watershed urbanization over a thirty year period from 1966 to the late 1990's. 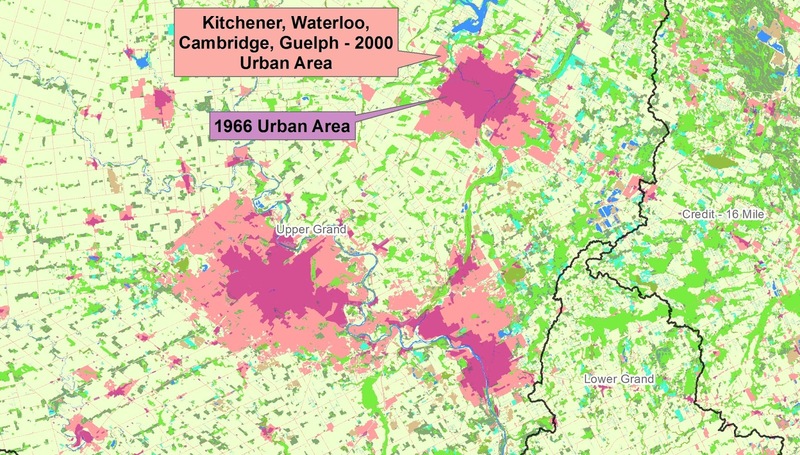 In some Toronto watersheds, urbanization increased by 986%, and that does not even consider intensification within previously developed areas. This analysis begs the question: "Why is there such a disproportionate focus on global climate change impacts to local extreme weather (now disproved) to explain flooding, compared to a focus on the obvious land use changes on hydrology, and increased runoff under historical climate conditions?" 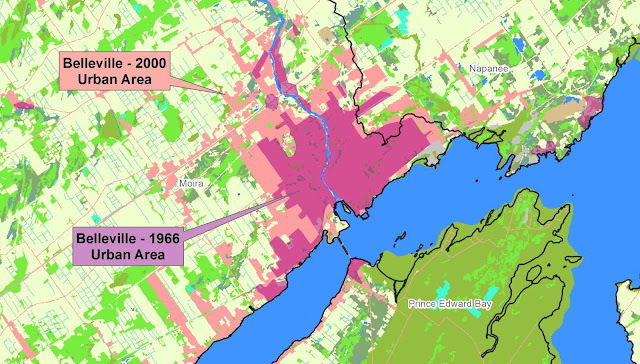 The following map shows the increase in urbanization from 1966 according GIS mapping converted and shared by Ducks Unlimited (source is the Canada Land Inventory Land Use 1:50,000 scale mapping for Southern Ontario), and to 1999-2002 per the SOLRIS Version 1.2 land cover GIS mapping, as compiled in the Ontario Land Cover Compilation Version 2.0 and available through Land Information Ontario. 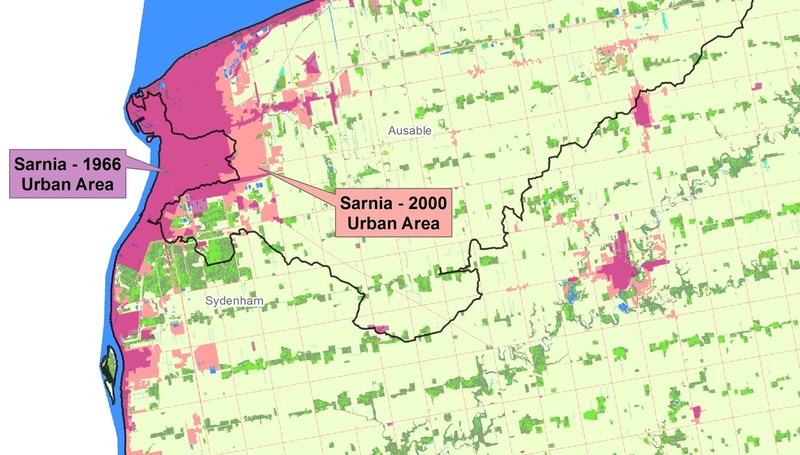 Clearly, the amount of urbanization has increased dramatically in southern Ontario watersheds, including many that have experienced flooding in the past decades. 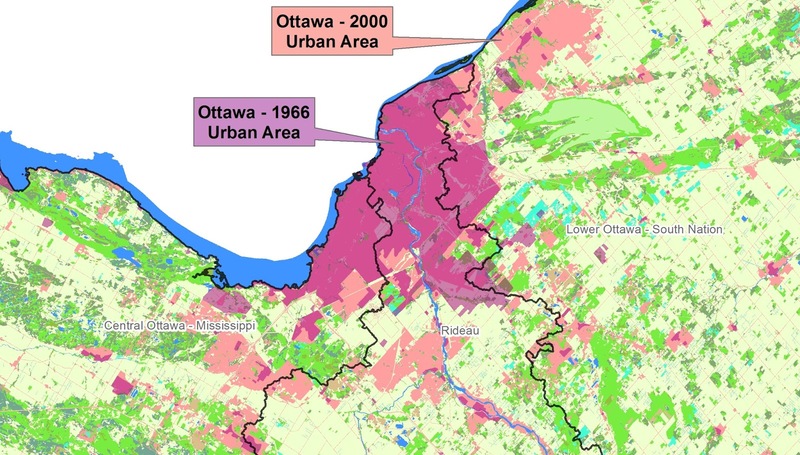 In about 30 years, urbanization has increased by 986% over and above the 1966 amounts in the Rouge River Watershed, and by 696% in the Duffins Creek Watershed. 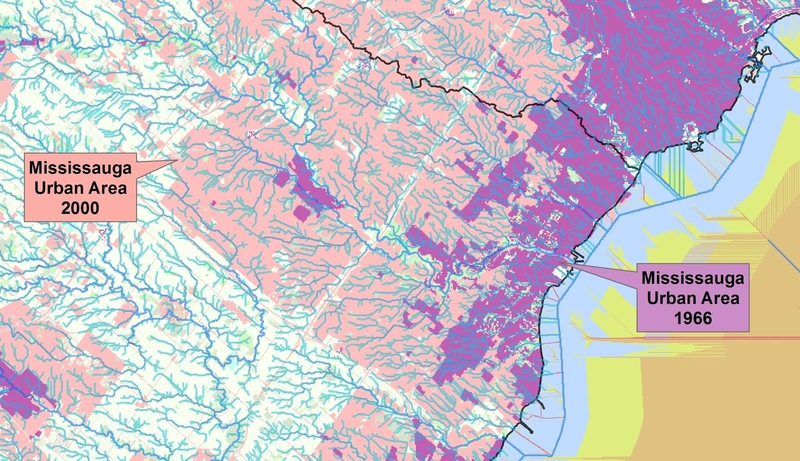 In Toronto area watersheds, unlike Rouge and Duffins, the increase is also dramatic - not as much for the percentage increase, but for the relative coverage. The Highland Creek Watershed increased by an added 124% over the 1966 coverage, resulting in over 88% urbanization coverage. Similarly, Mimico Creek Watershed urban areas expanded by 135% more, also resulting in over 88% urbanization by 1999-2002. The following table shows the TRCA watershed breakdown. How about Mississauga where there was flooding in 2013? 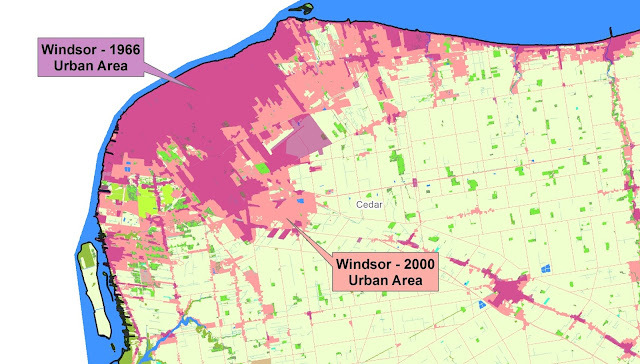 Well, Etobicoke Creek Watershed added 341% urban coverage resulting in 64% coverage by 1999-2002. Yes it should seem greater, but we have not counted the valley areas or other large open or vegetated areas within the urban areas (e.g., hydro corridors, etc.). We have also subtracted these 'greenspaces' from the 1966 data to avoid over-reporting the 1966 coverage, as the 1:50,000 source data was not as detailed as the the SOLRIS data that classified land used down to a 15 m cell resolution. And the Cooksville Creek area in Mississauga? 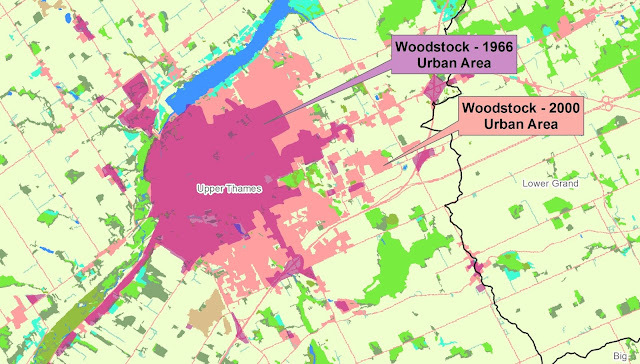 In 1966 urban development extended generally up to Dundas Street, while 30 years later it extended to Highway 407 as shown in the image below. 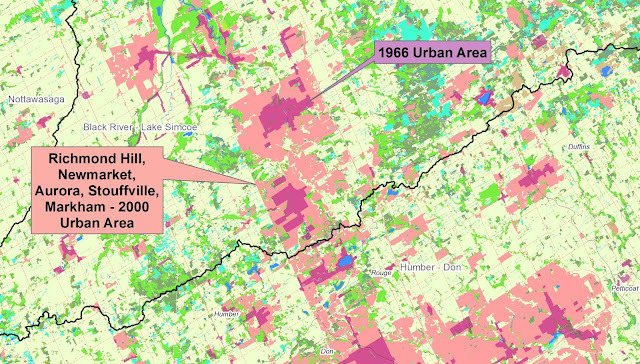 Mississauga Urbanization 1966 to 1999-2002. Do the math. 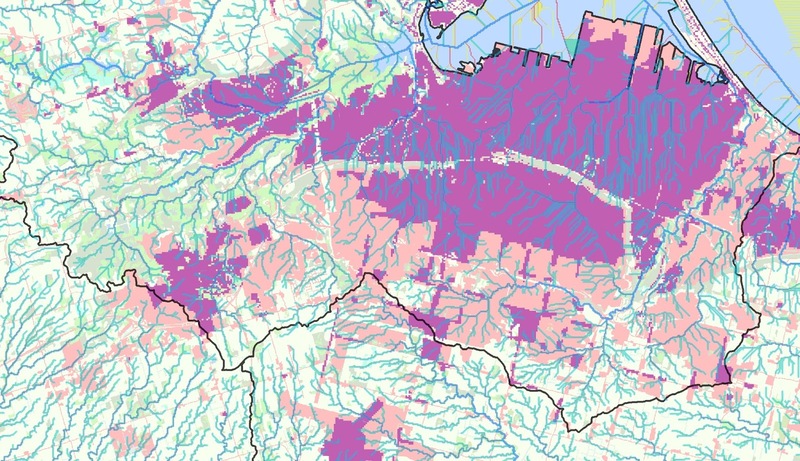 Nearly an order of magnitude increase in urban coverage in one large watershed. 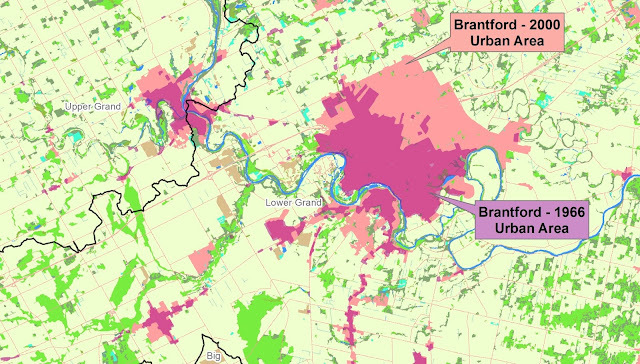 Doubling of urban coverage in all but one other TRCA jurisdiction watershed. And even more intensification within the old urban areas. Runoff potential has increased dramatically as a result. 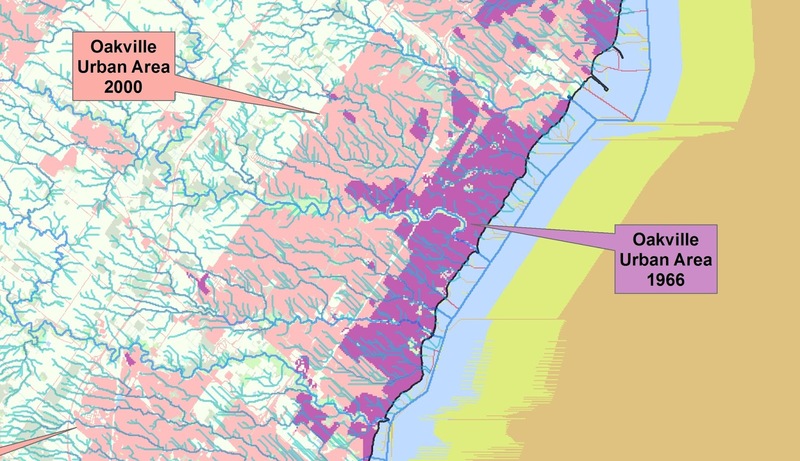 This explains increased flood risk in urban areas. While stormwater management controls have been put into place for some later developments to mitigate hydrologic impacts, these are finite, perhaps up to 100 year storm standards - extreme weather events can be above or below that threshold, meaning flood damages can occur for the large events. Furthermore, many infrastructure components put in place decades ago are not sized to handle 100 year storms, and have been designed to overtop for high frequency, lower return period events (e.g., underpasses, local roadway crossings). Neglect obvious present hydrology. Instead, generate theoretical climate change storm impacts .. with computer "games", i.e., models, or even basic high school math probability density function manipulation. And happily fund every climate change prediction or adaptation study. Redevelopment and increased urbanization in east Toronto - no residential, single lot stormwater management controls to mitigate runoff impacts to existing drainage system.